Although it is difficult to pinpoint exactly when we joined this notorious race, we most certainly can choose when we take ourselves out of it. One of the problems with this race is that there's no finish line. There's no one waiting to hang a medal around your neck. Heck, you won't even get a ribbon for participation. But what you will get is a lifetime of accumulating things that don't do anything to improve your quality of life. In fact, the more money you make, the more stuff you need. Even when you get a promotion, you still won't get ahead because your burn rate keeps pace with what you make. And unfortunately, the longer you're in it, the more natural it begins to feel. So what can you do to jump off this track? Well it's quite simple, stop spending your money on things that don't improve your live and start investing not only in yourself, but in stocks and real estate. Then you should join us after hours, as we learn how to get ourselves off the hamster (rat) wheel of life/ out of the “Rat Race” and onto the Fast-Track with money that's working harder than you are!? 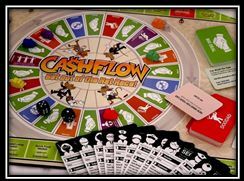 This will be an afternoon of teaching, learning and playing Cashflow 101 created by “Rich Dad Poor Dad,” Robert Kiyosaki in a fun-relaxed environment. Don't worry if you have not played before. We will have table for all levels of expertise. …. and most importantly, how to get your money working for you, instead of you working it! And if time permits, we will discuss real-life deals, applicable lessons from the game, and strategies for getting out of the real Rat Race.